It was pitch black at Bryan’s Revolution Café and Bar, a smoky fire behind us, when Sergio Villalobos claimed that more vital than becoming “experts”, what really mattered was to produce an encounter that permitted us to leave our “skins behind”. In a similar vein, I added, that lizards too lose their skin in the desert. Lizards in the desert: that seems to be the right image to describe what was indeed a productive and worthwhile, and much needed conference on Reiner Schürmann’s oeuvre. The purpose of the workshop, if any at all, was far from wanting to establish a consensual theoretical frame on “Schürmann” as yet another proper name within the marketplace of ideas. Rather, it seems to me that at the center of our debates, to paraphrase Schürmann himself, was a “nocturnal knowledge” of sorts, a constellation that produced moments of encounter and releasement; a thinking on the basis of the epochal structuration of the history of being and the exhaustion of principial thought. What remains of interest in Schürmann’s thought is the potential to make thinkable the relation between hegemonic phantasmatic maximization, principial articulation, and the question of finitude (what he calls the tragic denial in his monumental and posthumous Broken Hegemonies). If anything, Schürmann contributes, as noted by Alberto Moreiras’ introductory remarks, to the archive of infrapolitical thought in a line of reflection folded within the contemporary university discourse and the consummated politicity of globalized machination . To be sure, to “become lizards” is very different from “becoming Schürmanians”. The first thrives for releasement of tragic denial, and posit in the singularization to come in what it can no longer be reduced to the will, which is also the predicament at stake in thinking by and through principles. The second is the professional philosopher committed to the accumulation of knowledge, and by consequence, to the denial of the singular in the name of the duties of imposed on life. There is no normative judgment in making this distinction, but rather it is a matter of a tonality, and of establishing differences. One needs not “sacrifice” the epistemological grounds that demand the first in appropriative gestures of the second. “Nocturnal knowledge” signals a drift of thought that is not longer bounded by the location drawn by heritage, proper name, archive, expertise, or even ethical relation. Yet all of these remain of importance, even if not exhausting the possibility of thinking otherwise beyond the masters and the articulation of “being in debt” as a structural position or intellectual commitment. It is futile to reconstruct a debate whose consequences and “effects” are always beyond our reach. What I would like to do in the remainder of this note, is to sketch out a hasty catalogue of “five hypothesis” – by no means the only hypotheses discussed during the rich two days of discussions at Texas A&M – that will inscribe, at least for me, a path of further investigation and writing to come in line with the project of infrapolitics. The “epochal” hypothesis. Schürmann’s breakthrough philosophical project is without question the monumental Broken Hegemonies. Surpassing a telic drive of Heidegger: Being and acting, BH installs the topology of the history of being as a heterochronic montage that, as powerfully argued by Stefano Franchi, “rewinds” or unwrites to a certain extent Hegel’s Phenomenology of Spirit. Deremption against the synthetic offers parameters to think the differend of naturality and mortality in a strictly non-dialectical movement, but still a politically significant one. For my purposes, what is at stake here, besides the ruin of any philosophy of history, is the translation of the legitimacy-legality differend that opens another way of thinking the legal and legitimate grounding of the categories of modern political thought. Epochality and epochs establish a reversal of the metaphoricity of history, contributing to the historicity of being that radically retreats from the “poem” of development. The nexus between epochality and the end of principial thought (or anarchy in the face of globalization) is a daunting question that remained open in much of our own reflection on Schürmann. Villalobos-Ruminott picked up the subtle but open Schürmann critique of the “deconstructive text” at the beginning of BH as to go into the “thicket of the text” (BH, 15). But if this is a crucial task, is not the task of deconstruction precisely the drifting beyond the “hegemonic maximization” towards those spaces that remain contaminated by the labor of minimization and transgression? The very legislative differend Derrida-Schürmann remains a fertile space for problematization. In other words: how can we think the postulate of the post-hegemonic ultimate from BH last pages with the deconstructive differànce? The Democracy hypothesis. It is not obvious in any case how Schürmann himself situates the problem of “Democracy” at the intersection between the end of principial thought and the maximization of legislative-transgressive norms. If infrapolitical reflection is also a question about the potential of democracy, then it remains to be thought how Schürmann’s work contribute to this task beyond the limitations of the political that structure Arendt’s work (which seems to be the modern thinker that best informs Schürmann’s thought on democracy). Guillermo Ureña’s transversal take on Schürmann and Marzoa’s Concepto de lo civil, indicates a point of departure in light of singularization to come as it faces its tragic destiny. The question of democracy gains space of its own if it could radically differentiate itself from the maximization of community, which binds the maximum phantasm of hegemonic politics in light of natality and the denial of the tragic. If we take Arendt to be a thinker that establishes an antinomy between the oikos and the polis, it is easy to sidestep the question of stasis or civil war as always already fantasmatic constitutive of any demos articulated between these two poles, as well as any promise of “democracy” regulated by the category of the citizen . In light of our current “global war”, however we understand it, is difficult to affirm democracy without taking into consideration the facticity of neoliberalism. This was the relevant point made by both Charles Hatfield and Patrick Dove on the “life without why” as replicating or even coinciding with the nihilist condition of transnational accumulation at the “end of history” ideologies. The “life” hypothesis. Alberto Moreiras and Stefano Franchi’s noted in contrasting ways how BH necessarily opened to the question of “life”. The radical opening towards the tragic denial recoils back to this problem where another relation of experience (passion) must be thought. If for Franchi the tragic opens back to natality and even to the comic; in Moreiras’ grammar it is a matter of affirming the existential analytic where something like an “infrapolitical breakthrough” could possibly take place . Let’s call this instance infrapolitical dwelling or breakthrough. In terms of the “possible”, and what is meant by the possibility of that which remains impossible, Ronald Mendoza reminded us that it is a task to be pursued on the threshold of Heidegger’s rendition of possibility in Being and Time. This is no mere exegetical task, since what is at stake here is nothing other than the confrontation with the economies of reading and thinking through Aristotle’s Metaphysics, reconsidering the relation between dunamis and energeia. It is in this direction or turning towards the possibility where something other than a biopolitical closure. Releasement towards the tragic destiny is only evoked to reopen the question of life beyond the antinomies that organized logics of causation and distributive ontologies that, in the words of Agamben in Lo aperto, have only fueled the anthropological machine of the West that divides the animal and the human. The “text” hypothesis. It would be unfair to treat Schürmann’s architectonics of the topology of being as sidestepping the question of narrativity and the literary text in general. What are myths if not a textual machine, as understood by Jesi, which plays on the organization as well as excesses of each economic phantasm? Nevertheless, much work needs to be done to wrench Schürmann’s topological arrangement of the history of being in relation to the function of literature. It is at this intersection where Dorfsman’s meditation on the poetics dwelled, as well as perhaps the figure of the marrano strategically analyzed by Humberto Nuñez. Literature has all to do with a textual economy that is the excess of hegemonic maximization, and that for this reason is difficult to locate on a single plane of ordering and commandment of language. But what becomes clear is that through Schürmann a tropology opens with fundamental consequences for grapping with “life”: this is the “fool” as suggested by Franchi, Don Quixote’s wandering joy through La Mancha alluded by Teresa Vilarós, or Moreiras’ pícaro. I would also suggest Dante’s Divina Comedia, where mundane life seem to mark the passage from the hegemonic Latin phantasm of natura to the sovereignty of the modern passive epochality . The Luther hypothesis. It seems to me that the only major figure that throws off a shadow at the grand epochs of the topology of being is that of Martin Luther. It is a risk that Schürmann takes, but that allows him to read the modern tradition of the subject against the grain of Descartes’ cogito, Kant’s autonomous subject, or Spinoza’s Deus sive natura. Luther stands out in BH as an outsider that fundamentally returns to inflict the totality of the modern structuration. It is through Luther that we are confronted negatively with a possibility of the de-basement of the subject, emptying the signifier of “God” that connects with the releasement and play in his analysis of Eckhart’s sermons. Jaime Rodriguez Matos rightfully noted that the arguments on the existence of God, far from being the central problem, function as a pretext for an underlying problem consistent with the ruination of the subject. And what has been modern politicity if not hyperbolic to the condition of subjectivity? The figure of Luther for Schürmann signals passive transcendentalism and the opening towards heteronomy, which must be understood in light of the subject of command through duty and debt. It is here where Sam Steinberg’s reflection on the Mexican modern politicity as a history of debt resonates with the modernizing paradigm in Luther. The militant figure of Worms offers another paradigm to understand the epochality of secularization, and reassess Schmitt’s well-known “occasional decisionism” (Löwith) in differential positioning with the passivity of the vocation. It is also through Luther that Hegelianism becomes an epochal possibility (impossible?) for the narrativization of the history of the West. Luther also signals the problem of returns not only in the modern epoch, but also as Jose Valero argued in his own terms, in relation to the arche of metaphysics and repetition. How does tradition gets transmitted and repeated? In slightly different terms, Michela Russo’s problematization of heritage also speaks beyond the metanarrative task imposed by Schürmann’s “archive”, situating the archive as command and origin of a form of doing history of philosophy; even if it is aprincipial history that questions the very antinomy of progression / containment. As Hispanists or Latinamericanists working in the contemporary university, one must renounce the burden that implies carrying forth or reproducing Schürmann’s legacy as a question of fidelity, preservation, or even detachment. The history of the topology of being, argued Moreiras, seems at moments even more complex than the one offered by Heidegger himself. This much is needed. Metaphysics will neither be abolished nor put to a standstill with Schürmann’s injunction in the theoretical scene. For my purposes, a possible turning would always be a-locational, and for that very same nature, incalculable. In lesser words, this would imply the suspension of the very ground that feeds into our beliefs. Giorgio Agamben. Stasis: civil war as a political paradigm. Stanford University Press, 2015. Eric Auerbach. Dante: poet of the secular world. University of Chicago Press, 1961. 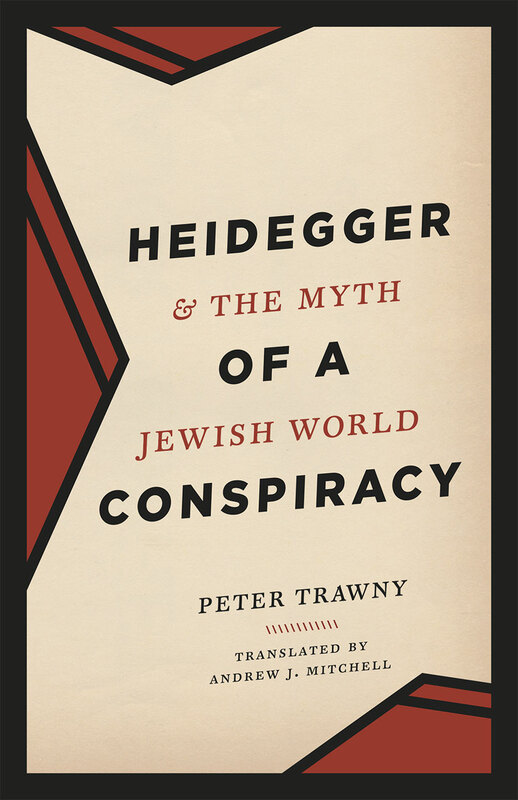 One of Peter Trawny’s main theses in his new book Martin Heidegger & the myth of a Jewish world conspiracy (University of Chicago Press, 2016), if not the central one, is that the expansion of machination at world scale was identified by Heidegger not only as the invisible power in the hands of a “dangerous band of Jews” (as Jaspers writes in his Philosophical autobiography), but also as “North America”, understood as the hyperbolic location for the fulfillment of wordlessness calculation. “Americanism” was tacitly interpreted by Heidegger as completion of nihilism, due to a “gigantism” that surpassed even the English overseas imperial trade. America lacked a proper destiny. Against the idea of Empire built on the thriving commercial rationality, Heidegger counter-posed a non-biological conception of race ingrained in the possibility for a German turning vis-à-vis the poetic, the gods, and “the encounter in which each learn through what is respectively foreign” (Trawny 2016, 52). Whereas the “other beginning” for Germans was marked by the event of being-historical, continues Trawny, “Americanism is simply incapable of a beginning because it does not know the “origin”, because it is the offspring of an English that pursues its “gigantic business” (Trawny 2016, 37). Taking distance from American machination also implied an open anti-Semitism within the history-of-being, conditioned by a fear due to loss of ground and a-locational fissure of dwelling. If this is Heidegger’s position in the recently published Black Notebooks, one could read here a paradoxical conjunction between Trawny’s first book Freedom to fail: Heidegger’s anarchy (Polity, 2015)- where errancy signaled not just momentary slippages of thought, but constitutive phases of his philosophy – and now errancy as privation of historical destiny. It seems as if between Trawny’s first and second book on Heidegger’s Black notebooks, what we get are really two types of errancy: the first that has to do with the site of the philosopher’s thought in opening of the Ereignis and second phase, where errancy is externalized and deeply connected to the anti-semitic a-locational dwelling in America. It is here where one could partially inscribe a distance against Heidegger’s anti-Americanism, and establish an alternative anti-anti-Americanism, which would neither affirm the dismissal of America as the site of nihilism in the name of “Destiny” or lack thereof, nor uphold a populist or American imperialism in the name of modern mass consumerism and historical exceptionalism. Rather, it is precisely the a-locational errancy which one could affirm as a third space of an American experience of freedom. This will be the Marrano freedom, both at the level of politics as well at the level of the work within the university (knowledge). “World Judaism spurred on by the emigrants let out of Germany, is everywhere elusive. In all the unfurling of its power, it need nowhere engage in military actions, whereas it remains for us to sacrifice the best blood of the best of our people” (Trawny 2016, 30). It would be wrong to infer from this annotation that Heidegger is making a plea for a sacrificial substance within the German history-of-being. In fact, as Trawny reminds us, Heidegger’s anti-Americanism is accompanied by a deep regret against Germans who, instead of following the path of poets and thinkers (the conference on Holderlin’s Ister was given during the war), were deceived by the “rootless foreignness” who reckoned unto German ground in Jünger’s total mobilization (Trawny 2016, 53). What fundamentally perturbed Heidegger, however, was not the errancy of the German destiny, but the fact that American machination had turned the “rootless foreign” in all directions and spaces. Returning invisibly to the very German ground. Why was the radical thinker of finitude unable to comprehend the horizon of democracy as consistent with the tragic condition of thought? This seems to be the limit of Heidegger’s intra-war politicity. A limit that Reiner Schürmann and Hannah Arendt’s problematize in their respective endorsements of aprincipial democracy. Against an easy dismissal of Heidegger’s thought, Schürmann’s Broken Hegemonies could well be said to affirm the a-locational errancy of democracy through the development of two of his master concepts: singularization to come and the releasement of tragic denial effectuated in hegemonic order. Beyond Heidegger’s another beginning based on Parmenides, Schürmann’s destitution of henology is reworked precisely in the name of a tragic democracy. It is interesting that both Schürmann and Arendt were thinkers committed to different projects of post-heideggerianism in United States and that neither affirmed an Anti-Americanism of North-American gigantism, nor assumed the conventional anti-imperialist anti-Americanism sentiment of so many Cold War Lefts. It would be naïve to say that Arendt or Schürmann “fixed” Heidegger’s anti-Semitic anti-Americanism, but both definitely rework the nexus between the democratic stature and the place of thinking against the grain of onto-theology. Trawny’s book do not take up these issues, but allow us to commence to discuss them. Our task leaves us with the necessity of affirming Heidegger’s dismissal of a-locational foreignness as a space of freedom of thought, if we are to remain committed to what in recent times Alberto Moreiras and Miguel Abensour have called savage democracy. America could well be said to be the name of that inheritance that is no longer in need of affirming a destiny or “a people”. The complicated conjunction between “principle” and “anarchy” is motivated on the alleged or suspected fact that the so-called “hypothesis of metaphysical closure,” and the consequent loss of any recourse to principles or principial thought, do not immediately condemn us to an a-principial world, since, on the “transitional” line, at the line but not beyond the line, we can only think, our language can only offer us to think, the lack of a recourse to principles through the painful enunciation of the principle of anarchy, the principle of non-principles. This is not a trivial affair. If, as Reiner Schürmann establishes at the end of Broken Hegemonies, a hybristic insistence on the maintenance of principles as constant presence equals something like (non-ethical, non-moral, but nevertheless overwhelming) evil, the principle of anarchy might also be considered historial evil—is it not after all a reluctant recourse to principles in the last instance? A desperate clinging to the principle—an irremediable and yet bogus extension of its presence—under the ruse of anarchy? How are we to negotiate the ultimate catastrophe assailing the hypothesis of closure? I do not mean to answer that question. Let me only point out a curious circumstance. Emmanuel Lévinas, whose work could be considered committed to the awakening of goodness in his sense, published Autrement qu’Ëtre in 1974. His Chapter 4 opens with a section on “Principle and Anarchy” (Otherwise Than Being, 99-102). It could be expected that any posterior attempt at dealing with the “and” in Lévinas´ phrase would refer back to that work and those pages. And yet Schürmann’s Le principe de l’anarchie. Heidegger et la question de l’agir (1982) devotes only one footnote to Lévinas (in the English translation, page 346, on the difference between originary and original Parmenidism), and, let us say, half of another one, whose main thrust is a sharp critique of Derrida: “Among the company of writers, notably in France, who today herald the Nietzschean discovery that the origin as one was a fiction, there are those who espouse the multiple origin with jubilation, and this is apparently the case with Deleuze. There are others who barely conceal their regret over the loss of the One, and this may indeed be the case with Derrida. It suffices to listen to him express his debt to Lévinas: ‘I relate this concept of trace to what is at the center of the latest work of Emmanuel Lévinas,’ Jacques Derrida, Of Grammatology, p. 70. The article by Emmanuel Lévinas to which he refers announces in its very title—‘La trace de l’autre,’ the Other’s trace—how far Derrida has traveled from his mentor. For Derrida, the discovery that the ‘trace’ does not refer back to an Other whose trace it would be, is like a bad awakening: ‘arch-violence, loss of the proper, of absolute proximity, of self-presence, in truth the loss of what has never taken place, of a self-presence which has never been given but only dreamed of,’ ibid., p. 112” (Schürmann, Heidegger on Being and Acting, n. 44, 321-22). As you have just seen, there is no mention of Lévinas’s take on “principle” “and” “anarchy.” Unless we take the implied, indirect critique to Lévinas’ notion of the trace as referring to an Other understood as neighbor, always already nostalgic of the pure presence of the One, as a terminal disagreement at the level of conceptualization. But the footnote does not really warrant it. So we can only hypothesize. For Lévinas “consciousness” does not exhaust the horizon of being and should not be, against modernity, considered the being of beings. Or perhaps it can, but then the positing of a me-ontological region, beyond being, certainly beyond consciousness, becomes obligatory. Within that structure, “principle” is very much on the side of consciousness: in fact, subjectivity is the principle. “Being a theme, being intelligible or open, possessing oneself, losing itself and finding itself out of an ideal principle, an arché, in its thematic exposition, being thus carries on its affair of being. The detour of ideality [Lévinas has just said that ‘even an empirical, individual being is broached across the ideality of logos,’ 99] leads to coinciding with oneself, that is, to certainty, which remains the guide and guarantee of the whole spiritual adventure of being. But this is why this adventure is no adventure. It is never dangerous: it is self-possession, sovereignty, arché” (99). If there were to be an “spirituality” beyond “the philosophical tradition of the West,” it would have to be found beyond consciousness, that is, beyond always already archic being. It would be the place of “anarchy.” Of a dangerous and adventurous anarchy. Anarchy is a persecution and an obsession. “The subject is affected without the source of the affection becoming a theme of representation” (101); “Anarchy is persecution. Obsession is a persecution where the persecution does not make up the content of a consciousness gone mad; it designates the form in which the ego is affected, a form which is a defecting from consciousness. This inversion of consciousness is no doubt a passivity—but it is a passivity beneath all passivity” (101). Far from being a hypertrophy of consciousness, it hits us as irremediable and always unwelcome trouble. It comes from outside. It is not domesticable, tamable, it admits of no reduction to arché. It is an absolute passion: “This passion is absolute in that it takes hold without any a priori” (102). Do we want it? But the question is only a question posited to consciousness, to the archic. Beyond consciousness we cannot resist it. What is it? Lévinas calls it “a relationship with a singularity” (100). It therefore irrupts from a “proximity” we cannot organize or measure, and it is a proximity beneath all distances (“it cannot be reduced to any modality of distance or geometrical contiguity,” 100-01). It is the “trace:” “This way of passing, disturbing the present without allowing itself to be invested by the arché of consciousness, striating with its furrows the clarity of the ostensible, is what we have called a trace” (100). Is this commensurate to Schürmann’s thought of the principle of anarchy? Does it come under the indirect critique of his footnote? Yes, without a doubt, it is “arch-violence, loss of the proper, of absolute proximity, of self-presence, in truth the loss of what has never taken place, of a self-presence which has never been given but only dreamed of.” Schürmann’s critique may hint at the notion that any surprise in this regard would be always naïve or feigned. It is true that Lévinas makes it dependent on the encounter with the other as neighbor (“What concretely corresponds to this description is my relationship with my neighbor,” 100). This is what Derrida is said to depart from, and what Schürmann seems to take for granted as correct. The irruption of anarchy should not for him, any more than for Derrida, be reduced to an encounter with human otherness, even if the encounter with human otherness could trigger it every time, or some times, also as a persecution and also as an obsession. In Lévinas the persecutory obsession of relational anarchy does not seem to be triggered by unspecified being—it is always a relationship with a singularity that does it. But, leaving Lévinas’ ultimate position aside, there is something else in Schürmann’s gesture of (non)citation that should be questioned. Schürmann seems to naturalize the persecutory aspect of me-ontological anarchy by positing (displeased) surprise at Derrida’s feigned surprise and celebrating Deleuze’s jubilation in the face of it. As if there were nothing particularly painful in being thrown over to an anarchic relation. As if, therefore, the resources of subjectivity—the subjectivity of the thinker—were or could be enough to keep the dangerous adventure of anarchy at bay, under control. But, if so, the principle of anarchy emerges, plainly, as principle, and principle of consciousness. Anarchy runs the risk of becoming yet another form of mastery. At the transitional time, posited as such by the hypothesis of metaphysical closure, metaphysics still runs the show as consolation and consolidation. But this may not be good enough. It is not exposure but counterexposure.